Monday to Thursdays I have set aside for some SAL’s and the intention is to blog about these on Fridays then blog on Monday on progress I’ve made on other crazy pieces I’ve worked on during the weekend. That leaves Sundays for YOP knitting posts and Thursdays for the Dishcloth Challenge and then any other days for baking and reading as and when they arise, this should give you an idea of when certain things will be blogged about. SAL’s this week commenced with me making a start on Monday with the Country Cottage Needlework’s Cottage series. This I’m doing as part of the SAL group HERE . I’m stitching mine on one piece of 40 ct Lambswool Linen. Progress was small as it was late Monday night when I started having worked all day on Ruairí’s completed pirates and my eyes were tired, not a good thing with 40ct. I am hoping I am going to get the January cottage done this month and then complete each month in its respective month but we shall see. Tuesdays is the SAL group of Elizabeth Hancock HERE . What can I say about this apart from it being totally gorgeous to stitch. 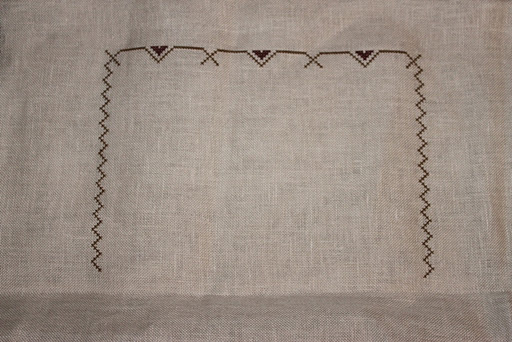 I am stitching mine on 32ct Light Mocha and I am using the recommended Belle Soie silks, so lovely to stitch with. Here is the progress from Tuesday night. Wednesdays are going to be for the Prarie Schooler ABC Patterns this is with this SAL group HERE . I am going to frame mine individually and then hang them together to make a collage of sorts when complete. These are going to be stitched on 32 Lambswool Linen using the recommended DMC threads. I have no progress to show you on this as I got waylaid by the fascination of my first knitted sock on Wednesday lol. Thursdays I’m stitching Robin Hood by LHN with Linda over at Stitchin with my Furbabies . I have a before last nights stitching session and after on this for you all. LHN Robin Hood at the end of the night. This weekend is IHSW weekend, so as soon as daily jobs are done this weekend I’m going to be devoting a lot of my time to stitching this weekend. 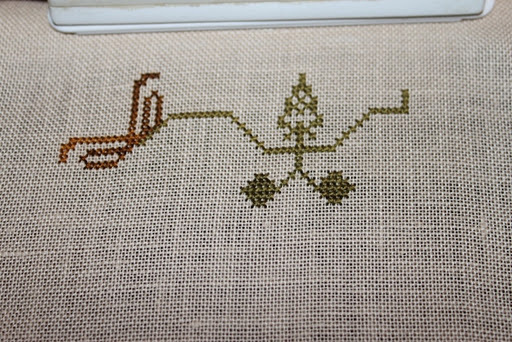 On the menu for stitching is my husbands hunting piece which will be needed after the Robin Hood piece is done. I also want to get a small Christmas ornament stitched, finished off would be great but stitched will do and then I may switch to something else that takes my fancy if I make good progress on the hunting piece. Post on all this on Monday. Sunday will be YOP post. This entry was posted in Uncategorized and tagged ABC, CCN, Cottage Series, Elizabeth Hancock, IHSW, January Cottage, LHN, PS, Robin Hood. Bookmark the permalink. 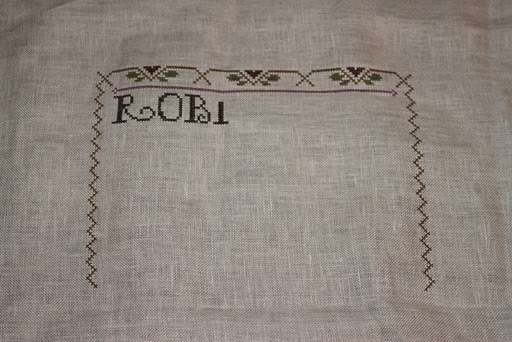 Some fab projects on the go Ruth, looking forward to seeing the progress, My cottage charts arrived this morning, so when I paid next week material and threads will be got, I cant wait to start. Yay for Stitch-A-Long's! 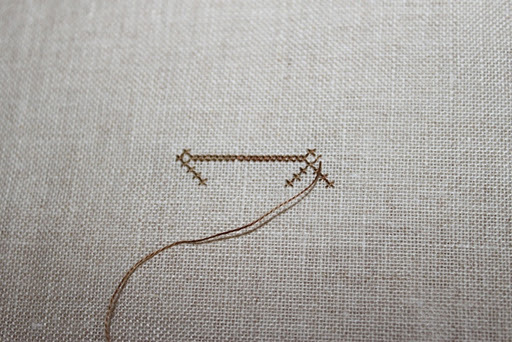 I am knee deep in exchanges right now – stitching with friends, even virtual ones, makes it so much more enjoyable. I love watching your progress, Ruth. You are so very organized! I didn't know you were stitching more projects that aren't in the CJC. Amazing!